Traffic managers and local authorities have a responsibility to help keep our roads safe and one of the best ways to keep accidents to a minimum is to present clear and up-to-date information to road users. Find out how our CCTV and VMS technology helps to keep roads safe. Despite Highways England commitment to reducing the number of people killed or injured while working on our roads to as close as possible to zero by 2040, ‘over the past 10 years, workers have been injured by motorists on more than 50 occasions….’ and ‘12 road workers, including two traffic officers, have lost their lives’. We appreciate it’s not always an easy job to keep traffic moving safely and driver frustration to a minimum, but with our innovative CCTV and VMS technology, traffic managers are able to respond quickly to changes in congestion on the roads and display this information to road users. Keeping drivers well informed is crucial in helping to keep roads safe. Used across a wide range of applications in different industries, CCTV can be especially effective with regards to traffic management. Road users who are aware that their actions could be caught on camera, are more likely to avoid driving too fast or recklessly, reducing the potential for accidents. Furthermore, the nature of the information collected via CCTV, especially when used in conjunction with other technologies such as automatic number plate recognition (ANPR), can effectively help to prevent and respond to accidents. Our VMS units enable traffic managers to effectively update information displayed to road users in real-time, to help keep drivers informed, warn of any upcoming issues and keep congestion moving smoothly. All our VMS and CCTV units can also be used in conjunction with our innovative WebStudio™ technology, which allows traffic managers to update their messaging instantaneously on any Wi-Fi enabled device. 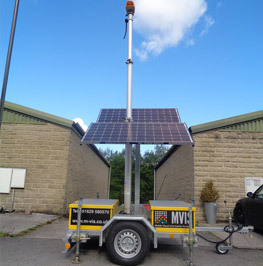 Not only are our CCTV and VMS units impactful when used individually, when used together they make the perfect partnership in helping improve the safety of our roads. * https://www.gov.uk/government/news/highways-england-highlights-dangers-faced-by-road-workers published 4th April 2017.